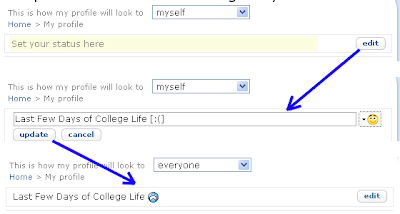 My oh My... last three posts being all on Orkut. These people have seriously gone berserk, with they have nothing else to do but to just Update Orkut. And now What they have added is the Status Update Feature through which you can update your status Just as you do in any Messenger. So Now is the time to say goodbye to the name changing habituals who used to change names so as to indicate what they do on orkut. SO now just add a Status Update and voila you are done. This feature was already in facebook and is a good initiative for those who like to keed their statuses updated be it on messenger or Social networking site. 1. Go to the Profile link on top of your Orkut home page ie go to the edit profile page. 4. Voila you are done. One thing That I think must be implemented is to include the status updates into the Recent Updates. So that the status updates is visible to all and not just to the ones who visit the user profile. I would not have noticed it this quick had it not been this article by Rahul. Cheers. Update:Orkut blog lists it Officially orkut Blog: What's new with you?